This post was co-written by Sahil Dave (and me) and was originally posted on Medium. In less than a week this post was posted on UX Collective, Sidebar, HeyDesigner and Webdesigner News. 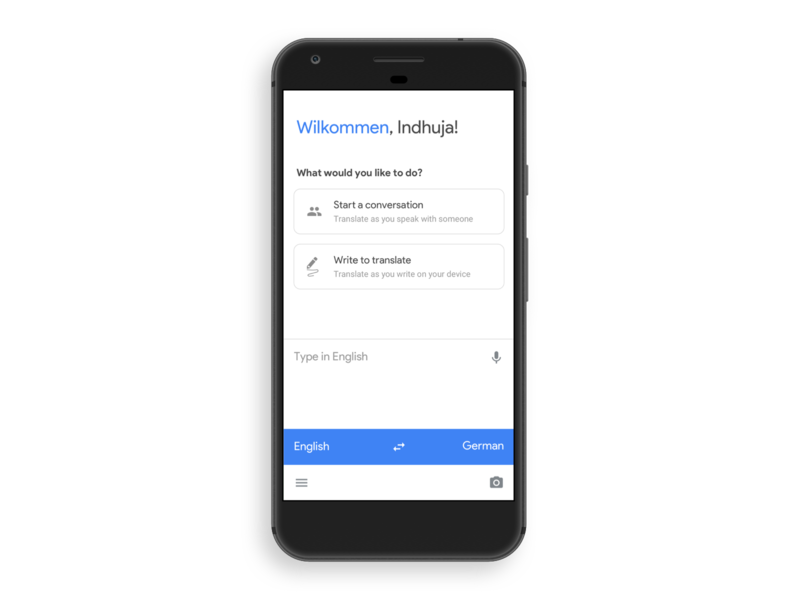 We moved to the wunderbar city of Berlin a few months ago and Translate has been a savior. A tweet from Alex Münch caught Indhuja’s eye and it all fell into place. We thought Google translate would be an interesting project to be occupied with. There are googol (pun intended) number of “redesigns” on dribbble which don’t really serve any purpose, and we hate it. We started with trying to solve one problem this time - Reachability. Taking inspiration from Google Tasks and Assistant for the Material Design 2.0 UI, we went with an all white and blue approach. We wanted the main action of a state to be highlighted with the blue color. As the primary need for the user while using the app was to view the translated text we tried to keep the translated text in-blue or on-blue. In the home state, the language switcher was on-blue. While typing, the real-time translation is in-blue. And finally, in the result screen, the translation is on-blue. This not only brings vibrancy in the UI but also directs the user’s eye to the highlighted part of the screen. Generally speaking, showing a “Recents” list is easier if the list has an infinite space below it. The natural behavior for the user is to scroll that list and view his history in a descending fashion. But, we had the input box at the bottom! So the list couldn’t be infinite. Next, keeping the height of short phones like iPhone 5/SE in mind, there was enough space for only maximum 3 items above the input boxes. So, in the end, we had only this tiny vertical space for all the things - recent, suggestions, “Did you mean” and “Translate from”. There was a certain complexity in simplicity. This astonishing reveal is the reason we are now learning more about the product - like the intricacies of the user flows and the original aim of the service as envisioned by Google- “Speak to the World”. We started only with reachability in mind but now we see the product as a whole from a more zoomed out view. And while seeing a product from up there, you tend to notice a few more things from a design standpoint. That’s why you need to raise your head above the water once in a while rather than being drowned in it, all day. We needed the fail to see things clearly. Now, instead of redesigning Google Translate, we have decided to work on the product as a whole. We’d be writing more about this endeavor as we progress. Stay tuned! This post was originally posted here on Medium.